Naked cash grabs can still be used in the service of good. Paramount certainly has no problems trundling out Star Trek DVDs on the flimsiest of excuses, and with the new movie hitting screens, they're more than justified in creating a little synergy. The two Best of Star Trek DVDs - one for the original series and one for The Next Generation - are aimed squarely at Trek newcomers and those who haven't experienced the show in awhile. Judging by the response to the latest film, there's apt to be quite a number of them, and while the original series DVD features the same characters as J.J. Abrams' reboot, the Next Generation disc holds numerous charms of its own. 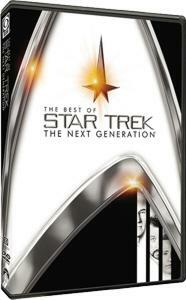 As with the TOS DVD, this one contains four episodes generally regarded as the pinnacle of TNG's seven-season run. Strictly speaking, however, it only holds three: the first being Parts I and II of the brilliant The Best of Both Worlds. 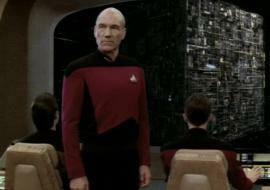 The crew of the Enterprise faces an invasion from the cybernetic Borg, who capture Captain Picard (Patrick Stewart) and convert him into one of their own. Commander Riker (Jonathan Frakes) must either destroy his beloved captain or risk the assimilation of the planet Earth… and there's no guarantee he can achieve either goal. Though it represented only their second official appearance, The Best of Both Worlds cemented the Borg's status as the most frightening villains in the Trek universe. Director Cliff Bole attained an eerie, relentless pace for episode, matched by an epic scope which even the full-bore cinematic release of First Contact could only imitate. The second entry on the disc is even darker if that's possible. Yesterday's Enterprise concerns itself with one of those pesky rifts in space-time, through which an earlier version of the Enterprise is pulled forward from the past. In so doing, it creates a seismic shift in subsequent history: the bright, happy TNG future vanishes, replaced by a more militaristic Federation engaged in a losing war with the Klingon Empire. If the old Enterprise isn't sent back where it belongs - its crew doomed to die and in so doing cement an alliance with the Klingons - the Federation my end up conquered vassals of their bony-foreheaded nemeses. The episode was notable for the brief return of Denise Crosby to the cast, having been killed midway through the show's first season. With all that gloom and doom, the final episode feels much lighter. In The Measure of a Man, a Starfleet scientist attempts to requisition Lt. Commander Data (Brent Spiner) for his robotic research, triggering a tribunal to determine Data's status as a sentient being. Though a tad heavy-handed, it presents a meaty take on the old "can a robot have a soul" debate while letting Stewart flash his Shakespearean chops with a closing courtroom speech. It's also worth noting that all three episodes feature Guinan, Whoopi Goldberg's wise woman on the mount who provides sage advice from the Enterprise bar. THE DISC: Though the transfer is solid and the sound and video quality are strong, the DVD offers absolutely no added features of any kind. Paramount has balanced that out with a very low purchase price - it's currently going for $9.99 on Amazon - making it easy to pick up on impulse. WORTH IT? Trekkies who already own multiple copies of these episodes in other collections needn't bother with this one. (They originally aired amid Seasons 2, 3 and 4.) For those who enjoyed the new movie and want to experience more of the Star Trek universe - or for those who, like me, haven't seen TNG in awhile - the disc makes an excellent way to dip your toe back in. RECOMMENDATION: A great bargain for the price and well worth picking up for dilettantes who may not wish to shell out the money for a full season.